I am blessed. 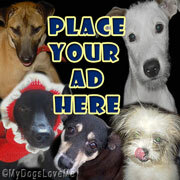 I have met fellow dog enthusiasts after putting up this blog. I truly appreciate the people who have visited us and shared with us their experiences with their dogs. Once again, thank you. The purpose of this dog blog is to disperse information. My aim was to inform both International and Filipino dog lovers that there's more to loving our dogs. Having a pack of 9 dogs is no walk in the park. We have taken strays before and we've experienced hard times juggling finances and providing them with adequate physical care, proper structure and mental stimulation. There are days that I am quite taken aback by some of the emails I receive. Some of them are from people who share their problems with their dogs, others tend to ask me where my pet store is and there are also others who ask me if I sell puppies. I have always made it clear that I am pro-adoption and I hope that people will someday take the initiative to visit their respected shelters (and pounds) to find an adoptable dog candidate. If you ask me medical advice, I will do my best to share my knowledge about it. However, nothing will ever beat bringing your dog to the vet for a check-up. If you ask me about adoption, I will try to locate a shelter. However, please do not expect me to give you a purebred dog or any dog for that matter. If you ask me about pet items, please be informed that I do not own a pet supplies store. However, I've dreamed of putting up one in the future. It'll hopefully give me a chance to interact and share my knowledge and experiences to fellow pet owners. If you ask me about dog behavioral issues, I will try to provide you with possible solutions. However, please don't expect me to be Cesar Millan or Victoria Stilwell. Whether it is an excuse or not, I admit that my resources are limited. I might not be able to do large scale rescues, take action on an email asking me to rescue a puppy or volunteer my time in a shelter, but I want to help in ways I am capable of. For now, it'll certainly involve blogging and information assistance..
We agree ...you deserve a thank you for all you do. Bravo to you. Have a terrific Tuesday. You always give such great advice to everypup! A big thank you, Mom never has enough inform about how to care for us nuts! We agree completely with others' comments - you are doing a wonderful thing with your blog and your voice and we think you should be PROUD. Kudos to you, for your blog, and informative posts. I cannot imagine managing nine dogs. We appreciate everything you share with us!!! You DO make a difference! By sharing and interacting you help others understand their furry loves better and more intelligently make decisions regarding their best interests. thanks for what you do. Good deeds have their rewards, and helping those who can not speak for themselves is very good karma. Keep up the good work! My salute to your kind-hearted appeal to adopt and not simply buy a pet. Good initiative for one who loves dogs to encourage others to adopt or find a dog that needs a new home versus buying them from pet stores. Well done! 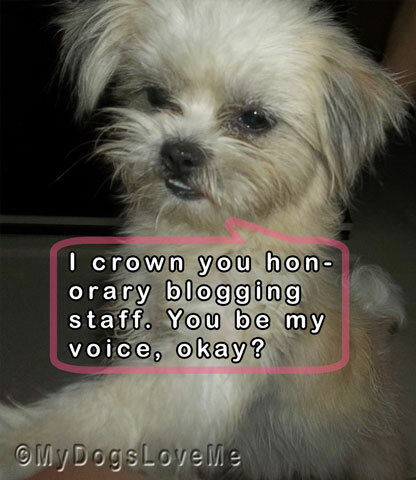 May there be more bloggers who blog for dogs. Rescue Dogs are the best Dogs. I know, because I am one. And so is Ojo! Everyperson needs a Rescue Dog (or two)!